As promised, I am starting to watch another trilogy, this time the Ocean's series, of course starting with Ocean's Eleven. I would have watched this later, but I had to get in before it got sold...which is weird because I thought it was a classic. With a cast full of Hollywood's hottest celebrities (if you could call George Clooney 'hot') and helmed by Steven Soderbergh, this film just spells classic, doesn't it? Danny Ocean (George Clooney) is a thief who has just been paroled from prison. He seeks out his partner, Rusty (Brad Pitt) and he has a job. And it is to rob the vault that houses the cash of three casinos in Las Vegas. And he plans to rob it on a night when 150 million is in it. So they recruit nine guys and they begin to put Ocean's plan in motion. Everything is going well until Rusty discovers that Ocean's ex-wife, Tess (Julia Roberts) is the main squeeze of Terry Benedict (Andy Garcia), the owner of the casinos. Rusty asks him what is he going to do if he has to choose. But Ocean says that if his plan goes smoothly, he is going to be able to have his cake and eat it. In my belief, Steven Soderbergh hasn't been such a great director of late. Sure, he did make that two part biopic Che, but did that get a theatrical release here? No. Then there was The Girlfriend Experience, which has the tackiest trailer I have ever seen. But don't get me started on The Informant!... So even though I had my doubts about Mr. Soderbergh's skills, I was still somewhat intrigued by his work with Ocean's Eleven, which is really just a Hollywood remake, but offers more than the average fare. 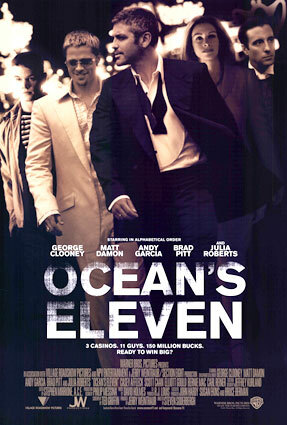 Ocean's Eleven is just an all-out fun film which doesn't take itself too seriously. Despite this, it does leave a little room for intelligence which meant I could easily relax into it whilst feeling satisfied with the outcome. If anything, this film is like the male version of The Devil Wears Prada...that's a fashion showcase for the women and Ocean's Eleven is a fashion showcase for the men. I imagine that tux and sunglass sales went up after this movie was released coz most guys would want to look like George Clooney or Brad Pitt. Speaking of which, the (mostly male) cast do exceptionally well in this movie, making it stand apart from other remakes/blockbusters. This is typically a guy movie, but I'm sure girls like me can enjoy it too. Steven Soderbergh succeeds in remaking a film for the modern market by making it fun but intelligent at the same time.